I saw these runs on the news this morning and they reminded me that exactly two years ago (I think when they were launched?) 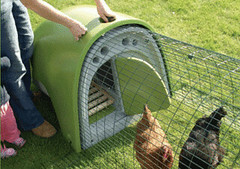 DH first mentioned getting an Eglu and some chickens. Mum and Dad have always had chooks and I’m well aware of the benefits BUT we do have a very small garden in a big city AND we have very grumpy neighbours. I can imagine there would be a problem. DH has been nagging me about this all that time and I have promised that ‘in the next house’ he can have his beloved chooks!